Here are Sai Baba's teachings, read on to know about teachings of Sai Baba. Sai Baba of Shirdi is the epitome of reverence a guiding force who generates supreme faith and confidence among his devotees looking for salvation and in quest of coming out of the drudgery of living. As a divine mother he is saturated with love for those who seek him. With his mission of making people about the divine consciousness and transcending the limits of mortal body, his teachings are guiding his devotees to the path of salvation. People are blessed who follow his teachings. 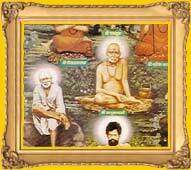 Among the teachings of Sai Baba of Shirdi there are the cardinal principles of Sai Path called 'Shraddha' and 'Saburi'. Sai Baba looks for these two qualities in his devotees. Here are the teachings and philosophies of Sai Baba of Shirdi. 'Shraddha' is a Sanskrit word, which roughly means faith with love and reverence. Such faith or trust is generated out of conviction, which may not be the result of any rational belief or intellectual wisdom, but a spiritual inspiration. According to Sai Baba of Shirdi, steadfast love in God is the gateway to eternity. Baba's teaching, both direct and indirect explicate the significance of 'Shraddha'. Baba reiterates the spiritual guidance of Shri Krishna to Arjun - "Whosoever offer to Me with love or devotion, a leaf, a flower, a fruit or water, that offering of pure love is readily accepted by Me". For Sai Baba it was not the purity of the body but inner purity that mattered. No amount of physical and external cleansing would serve any purpose if the man remained impure in mind and heart. Therefore, Baba cautioned His devotees not to make austerity as an end itself, lest they should indulge in physical mortification. Himself an epitome of compassion and love, Sai Baba taught compassion among his disciples. Baba often told His devotees, 'Never turn away anybody from your door, be it a human being or animal'. Sai Baba put Guru on a high pedestal of reverence. For Him Guru was the profound base of the path of devotion. Pointing to his physical frame, "This body is my house. I am not here. My Guru (Master) has taken me away". He asked for complete surrender to the 'Guru'. Udi or the sacred ash was produced from the perpetual fire called 'dhuni' lit by Sai Baba in Dwarkamai at Shirdi. Explaining the meaning of life He would refer to Udi and taught that like Udi all the visible phenomena in the world are transient. Through this example Sai Baba wished to make his devotees understand the sense of discrimination between the unreal and the real. Udi taught the devotees discrimination or vivek. Sai Baba would demand 'Dakshina' or alms from those who visited him. This explained the sense of non-attachment to worldly things. Hence Dakshina taught the devotees non-attachment or Vairagya.